Arab driver who killed woman turned over to Israeli security forces. Family of victim says ramming was terror, not an accident. The Palestinian Arab driver who ran over Hava Roizen (42) near Havat Gilad in Samaria was handed over to the Israeli defense establishment Sunday afternoon. Roizen was killed in the ramming incident last Thursday night. About an hour after the incident, the driver surrendered to the Palestinian Authority security services. On Sunday, the suspect was transferred to Israel for questioning by the Shin Bet. Despite the security establishment's assessment that the incident was a traffic accident, Roizen's relatives from Emmanuel remain convinced that the nicident was a terrorist attack. The driver claimed he had fled the scene because he was afraid he would be killed by Israeli security forces. 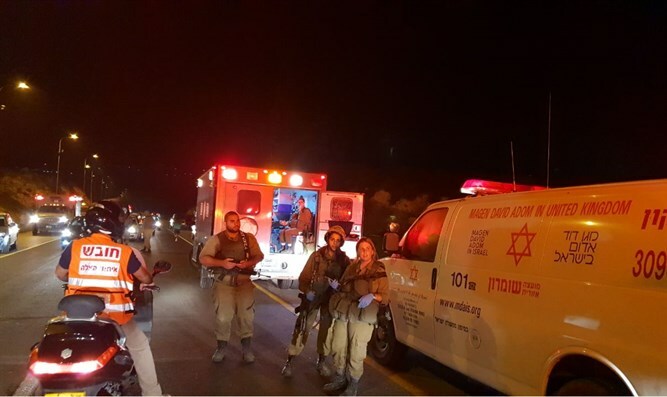 The leadership of the Samaria Regional Council also believes that the incident was a terrorist attack, at least until the Shin Bet investigation proves otherwise. Samaria Regional Council head Yossi Dagan said authorities had failed to properly secure the junction at which Roizen was killed. "The writing was on the wall," Dagan said, adding that four months ago he had asked the Civil Administration and the Transportation Ministry to arrange the junction. Dagan wrote a letter demanding that a police station be erected on the site, claiming that "the place is a security hazard." The appeal has not yet been answered and the Samaria Regional Council believes that the request is being ignored for political reasons. According to Dagan, "It is regrettable that political considerations come at the expense of human life. Whether it was a terrorist attack or whether it was an accident, Hava's life could have been saved. Time and time again, we asked to arrange the junction, but narrow political considerations overcame the consideration of human life." "We are sorry that the family of Hava and the residents of Samaria have to pay the price for this, and we demand that we change the approach on this issue and arrange the junction so that such disasters can be prevented in the future," Dagan added.